If you've got skincare woes, I've got your skincare solution right here! As in, literally, referring to the photo above. Now, I've already written about my everyday skincare from Dr Hauschka in this post here, but I also mentioned inside the post about how my facial therapist was the one who introduced the range to me and how it has helped me significantly ever since. 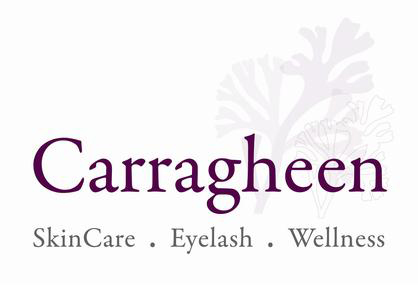 If you've always wanted to try an Organic Facial but always thought it was too out of budget, then look no furher. I've got a (very very wordy) answer for you. 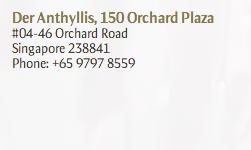 My facial therapist's name is Amy, and her shop is called Der Anthyllis. 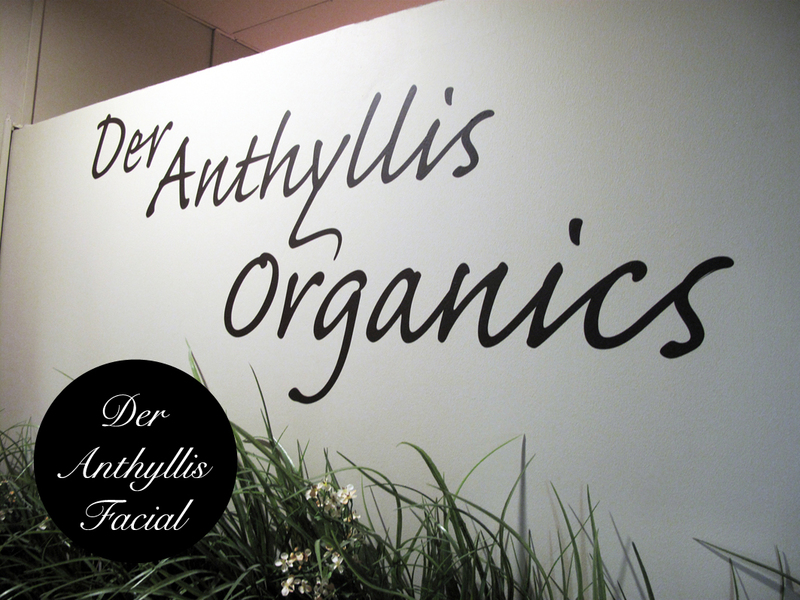 Amy, is first of all a Certified Dr Hauschka Esthetician. Second of all, she is different from a lot of other facial therapists I've been to (and I'll tell you, I really have been to many). She truly cares. She follows up after facials, and even asks me to take photos of my skin's progress so she can see if all is going smoothly. She never hard-sells me anything, which I really appreciate. Now, you might want to know that Amy can be quite firm and rather blunt; if you are easily offended, don't be. She really knows what's best for you and her comments will only help you. She is a one-woman business, so you might have to book quite in advance to get a slot. However, it only works out for the best because she pays 100% attention to you. I brightened this photo, the lighting is actually much dimmer. This is the inside of the shop she currently has at Orchard Plaza, Singapore. I didn't take many photos because she will be moving over to Forum soon. The place is very small, consisting of only about 2 rooms, but she only ever uses one. It is very minimalistic yet cozy with dim lighting, soothing music, and very beautiful aroma therapy. I do not know if many of you have been to facials, but basically you do have to be half naked and wrapped in a towel/robe. This is to allow your body to feel less constrained and for better blood circulation. Amy starts off with a foot bath normally, depending on what ailment you might have. For myself, I am constantly stressed, so she applies a Lavender one. It is supposed to calm and prep your body for the upcoming facial. She will also offer you some tea or warm water from time to time to relax and rehydrate. Amy only uses organic products for the facial, but she mainly sells Dr Hauschka at her store for your convenience in purchasing. Amy first removes all my makeup thoroughly, and follows up with the Dr Hauschka Cleansing Cream. You can see the difference above. Amy then applies a very fine netting over the face, which has been dipped in Dr Hauschka's Facial Steam Bath. This helps open clogged pores and activates the cleansing process. Dr Hauschka's Clay Mask is added onto the skin for about 15-20 minutes to draw out the impurities before extraction. 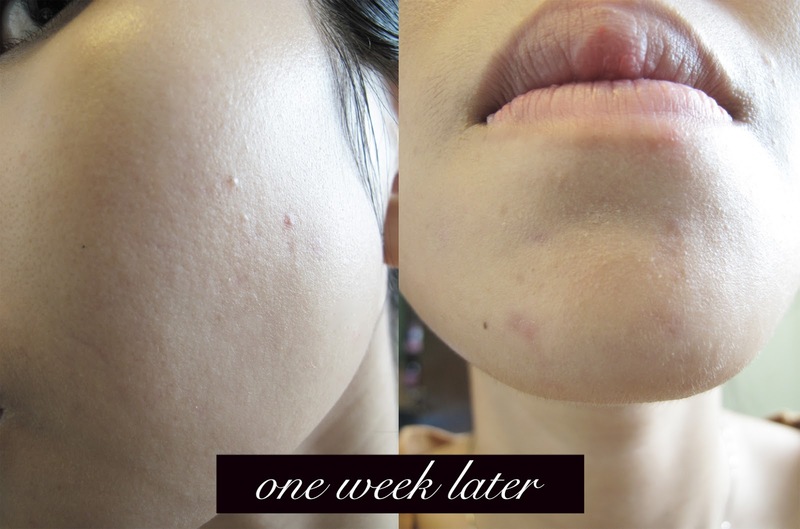 Amy's extractions are generally painless, unless of course you have cystic acne. Naturally, the larger ones will hurt more. What I love is her blackhead extraction on the nose which is really quite painless, and is mostly done with a tweezer and not the blackhead loop (except for some heard to reach areas)! It actually feels quite comfortable even! Amy normally helps me tweeze out some unruly hairs and cut off those which are too long. Now, do not mistake this as a free eyebrow shaping. It is nothing of the sort. She only cleans it up and neatens the eyebrows. 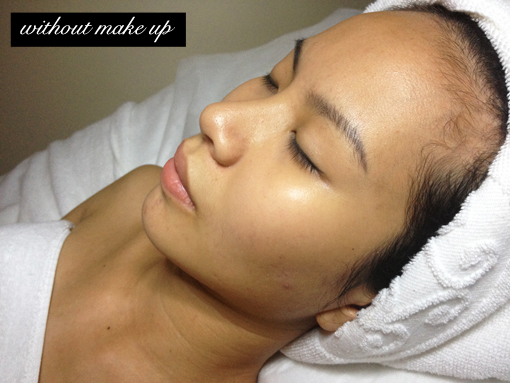 I mentioned before in my Taking Note, Taking Care post that you should never do a facial massage on your own. You do need a professional hand. Even so, Amy will decide whether it is suitable for you on that particular day of visit. Sometimes when my skin is unstable or too red, she stays away from it and only massages my body (which feels heavenly by the way.) She does this with the help of some oils, but it never feels greasy. The massages boost blood circulation basically, and allow the products to sink in faster and do their work. This also preps your skin for the finishing products. When Amy feels my skin is in need of extra care, she will put an extra mask on me for good measure. If not, she will finish up with the basic toner and moisturizer. 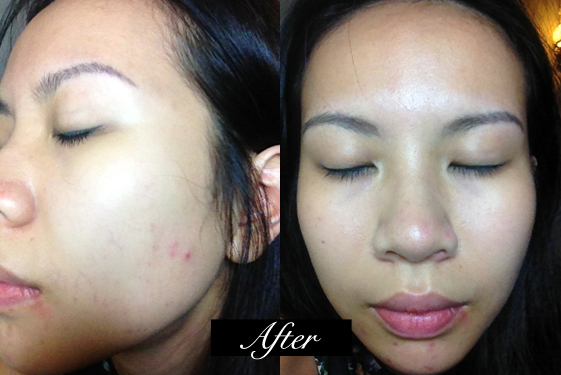 I have included these before/after photos for you to refer to. The top ones are taken from my previous visit in February and the lower ones are taken from my most recent visit in March. 1 week later: blemishes are smaller and chin scars are almost gone! This is a photo I've taken one week after the facial. Personally, I think that judging based on photos which are taken right after a facial just do not cut it because the treatment may be short lived. These images prove that the improvement takes place over time and continually works. 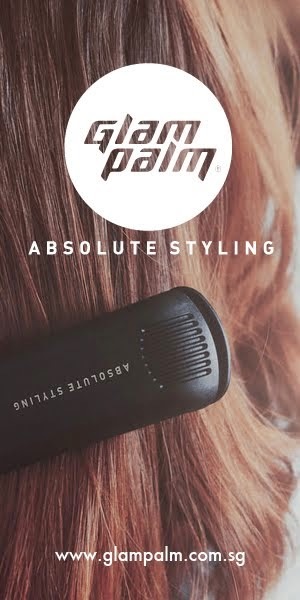 For our readers, I have set aside a deal with Amy for you guys to try her out! 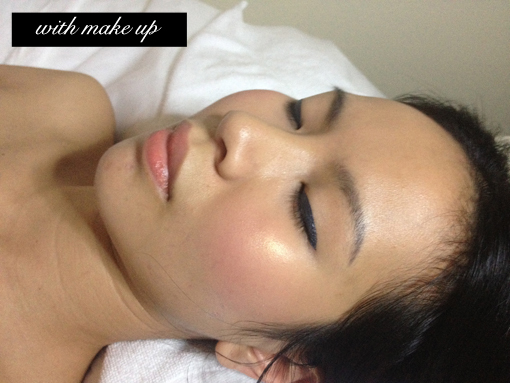 She can be contacted at: +65 9797 8559 (also does skin consultations). First Trial Prices - $68 (U.P $125), and $88 (U.P $238). Just quote "Samantha Ashley" to get this great offer! PS- I LOVE YOU AMY! Anyway, the difference I suppose will be in the length of the facial. The "$68" one will probably be about 1.5 hrs and the "$88" will be about 2-2.5 hrs long. Meaning that there will be more steps and pampering in the facial (I'm guessing there will be extra eye care and body massage)!